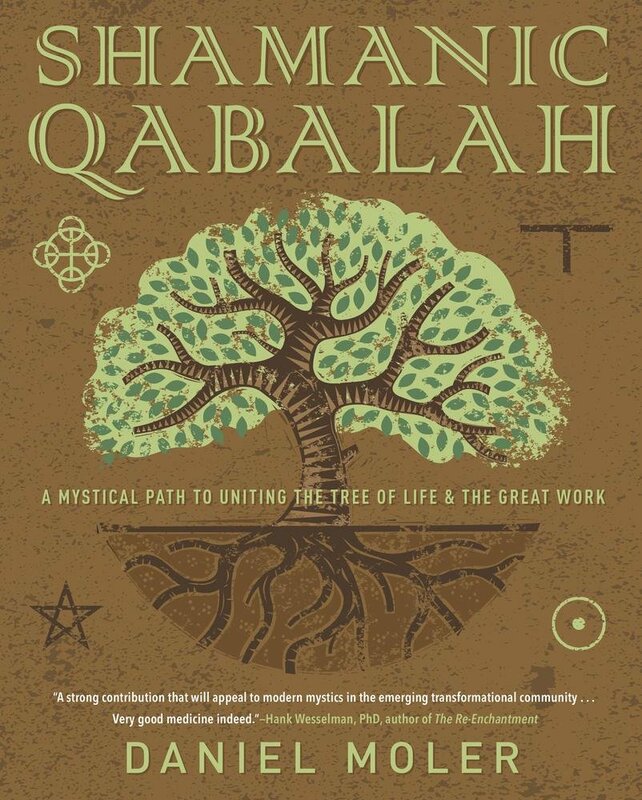 It is our pleasure to welcome Daniel Moler, AoM April, whose book Shamanic Qabalah provides a template for exploring the inner and outer worlds in the tradition of the ancients, by fusing Hermetic Qabalah and Peruvian shamanic practices. “Lanzón,” the Peruvian curandero commanded me. It was my cue to stand erect, my right arm extended upward, and my left pointed down toward the earth. He had addressed this with me before the ritual had begun, that I and a few select others were to erect ourselves thus if he were to proclaim the term during our ceremonial time together. We were engaged in a mesada, a traditional Peruvian shamanic ceremony in which participants consume a hallucinogenic tea made from the Huachuma cactus (also known as San Pedro). The ritual is a night-time sacrament designed for healing and sacred communion. In that moment, whilst standing there feeling somewhat silly, I did feel a charge of energy move through me, an ancient magic that Western language surely fails to explain. I had a realisation: I was standing in the exact posture as the figure of The Magician in the Tarot card. What was the connection? I wondered. In my book, Shamanic Qabalah, I have started the journey of weaving together my own spiritual practice and training in Peruvian shamanism with the mystical symbology of Qabalah, most specifically in the Western Mystery Tradition. The amount of correlations I have uncovered between these two traditions has astounded me, and it seems the material in my book is only the tip of the iceberg. It appears there is an enigma surrounding a very strong connection between pre-Columbian indigenous cultures and the occult formulas of Western esoteric traditions. The Western Mystery Tradition (WMT) designates an evolving lineage of esoteric practices that stem from various schools of thought over the centuries, including Neoplatonism, Hermeticism, Rosicrucianism and Qabalah. These traditions came into fruition in the 19th Century via figures like Éliphas Lévi and Madame Blavatsky, who began streamlining them into a more concentrated philosophy via the auspices of theosophy and ceremonial magick. What has blossomed from this merging is a sophisticated system of cosmology, symbology, and esotericism that many in the Western world have embraced as legitimate lineage of spiritual practice. The Tarot, a divinatory deck of cards rife with symbolism, is a significant outcome of the WMT’s evolution. Not only was this “pre-historical” civilisation very advanced, but it appears that the way in which these ancient cultures around the world understood the universe was also very similar. Back to Lanzón . . . 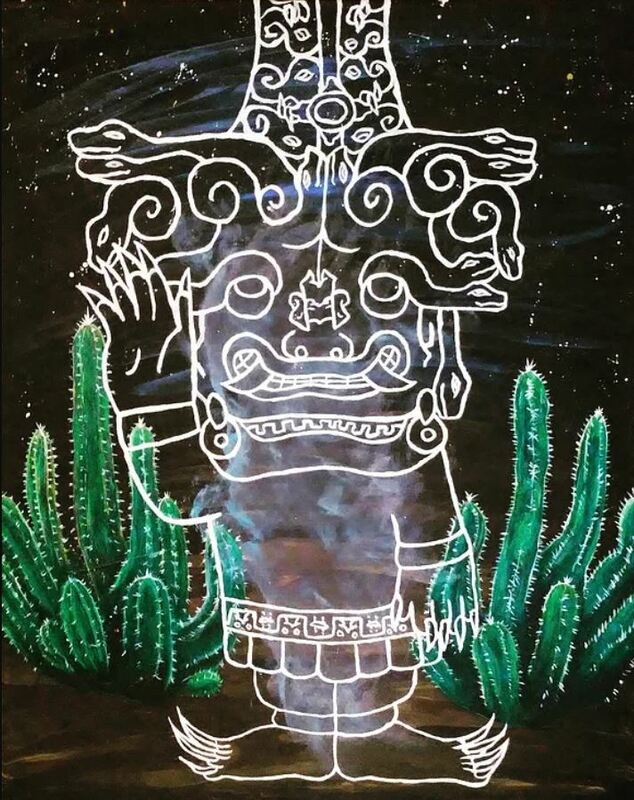 The bodily action the curandero in the Huachuma ceremony was having me perform was an imitation of an ancient statue found in the ritual temple of Chavín de Huantar. Carbon dated to around 3,000 BCE, Chavín de Huantar was the ceremonial centre of the Chavín civilization of Peru, located in the Mosna valley. Interesting to note is that the Chavín culture, and the temple site itself, hint at some of the first use of the Huachuma cactus as a religious sacrament. 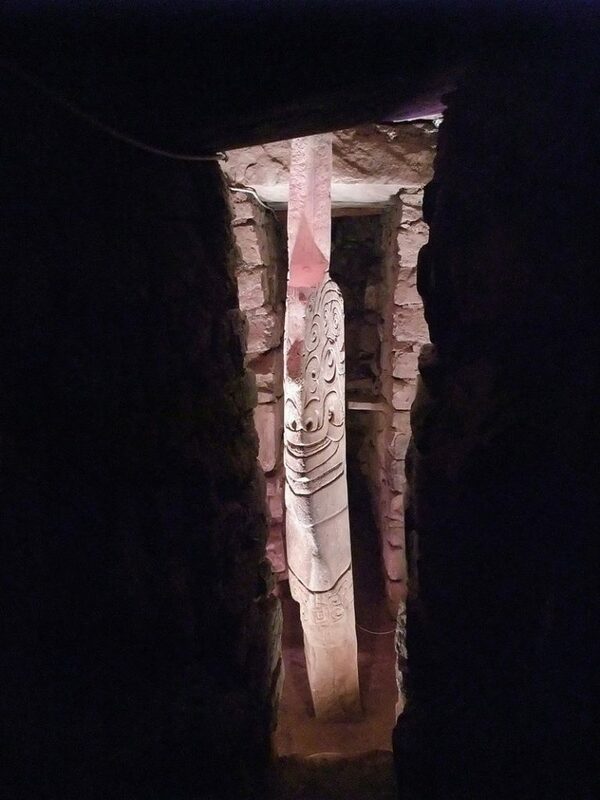 Participants would partake of the Huachuma medicine, which transforms the individual’s consciousness, and be led into the unlit hallways of the temple, wandering the maze in darkness until they came across a large granite idol: El Lanzón. We don’t know what it was called then, because there was no written language in Peru until the Spanish invaded. Archaeologists dubbed the statue El Lanzón (“the lance”) because of its spear-like shape stuck in the ground like a dagger, reaching through the roof of its chamber, extending itself into three parts of the temple’s layout (replicating the bridging of the three worlds: linking earth, heavens, and underground). El Lanzón was the axis mundi, the spiritual centre of the Chavín civilisation. Its snarling jaguar-like face is—like much of the imagery in the Chavin de Huantar complex—highlighted by serpents as wavy locks of hair. Other figures in the temple spout condor wings to boot, again another symbol of merging the three dimensions of consciousness together (jaguar = middle world; serpent = lower world; condor = upper world). Even within the WMT, Lévi confirms this cosmological paradigm in his work Transcendental Magic, as a reflective relationship between the microcosm and macrocosm: “Within us there are three analogical and hierarchic worlds, as in all Nature.”ii These three worlds, or forces, coming together in harmony is the symbol of the ideal human: one who is fully whole, de-polarised, and aligned with the natural forces of the universe. The carved relief of El Lanzón—when the etching is laid out—displays the figure with its right arm extended upward, reaching to the heavens, and its left arm pointed down to the lower world. “This pose,” Yale archaeologist Richard L. Burger, “eloquently expresses the role of the deity as a mediator of opposites, a personification of the principle of balance and order.”iii El Lanzón expresses a full-body mudra in which initiates can utilise to help bridge the worlds together into a single unity. The initiates themselves invoke El Lanzón, become the once-fragmented universe made whole in the self. 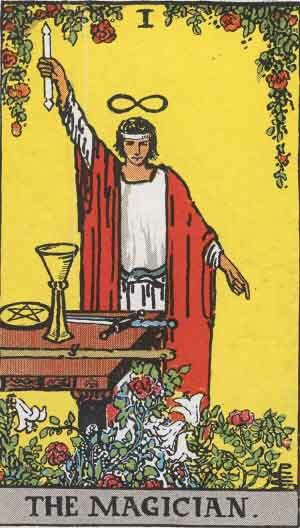 As stated earlier, this posture is also prevalent on The Magician, the first card of the Major Arcana of the Tarot. The Magician himself stands for the exact same principles as El Lanzón, channelling the forces of the universe from the wand or rod extended upward with his right hand, his left hand pointed downward or to the table laid before him, which displays the artefacts of his trade; magical tools representing the prime elements of matter: earth, air, fire, and water. It is a very peculiar stance, and though the Tarot has evolved over time, that one posture of The Magician most likely stems from the rendition of Baphomet by Lévi, who saw the image as a perfect harmony of opposites: feminine and masculine, justice and mercy, spirit and matter. 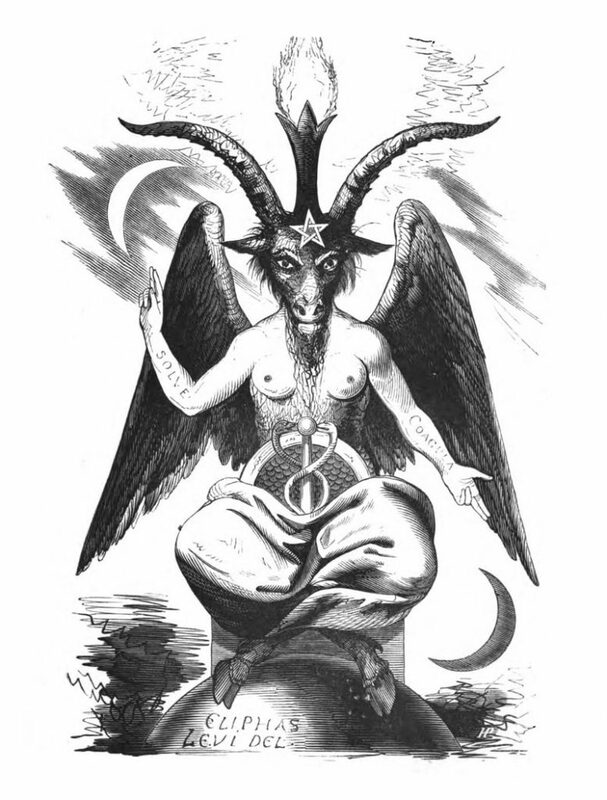 The inscriptions on the arms of the Baphomet figure, “Solve” and “Coagula,” refers to the alchemical axiom “dissolve and coagulate” meaning that something must be broken down before it can rebuilt, the formula of transmutation. The symbol of Baphomet, like El Lanzón and The Magician, is that formula: a map to the potential holism of human consciousness. These three are not the only images depicting this posture. 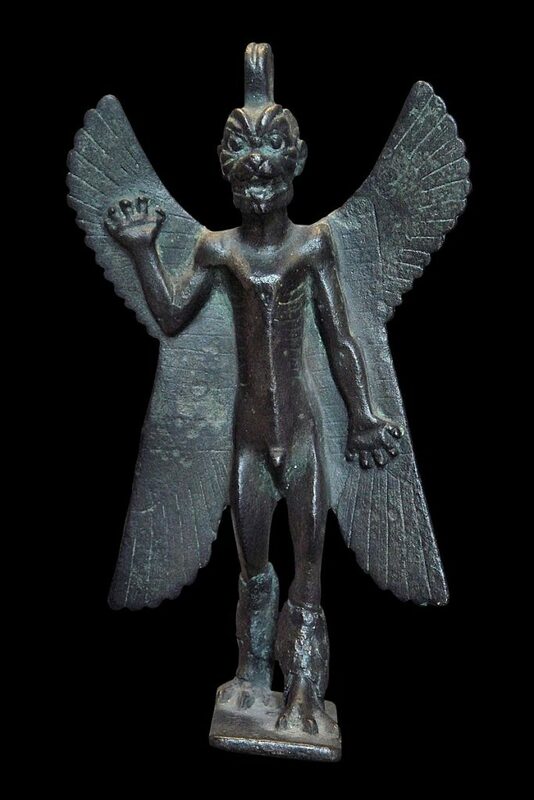 The statue of Pazuzu, Mesopotamian King of the Demons of the Winds, stands in almost the exact same pose (with feline face and wings to boot). 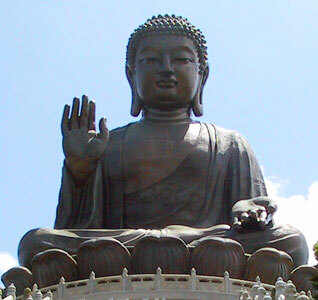 Many likenesses of the Buddha and Christ both sport a similar mudra—the right hand often upward, left hand down—with an even more complex set of meanings behind the intricate number of gestures represented in the cornucopia of imagery available. Above: El Lanzón, inside the temple of Chavin de Huantar. Below: enhanced image of El Lanzón inside the temple of Chavin de Huantar. By Daniel Moler. 19th-century image of a Sabbatic Goat, created by Eliphas Levi. The arms bear the Latin words SOLVE (separate) and COAGULA (join together). However, the connection between South American and WMT iconography doesn’t end there. 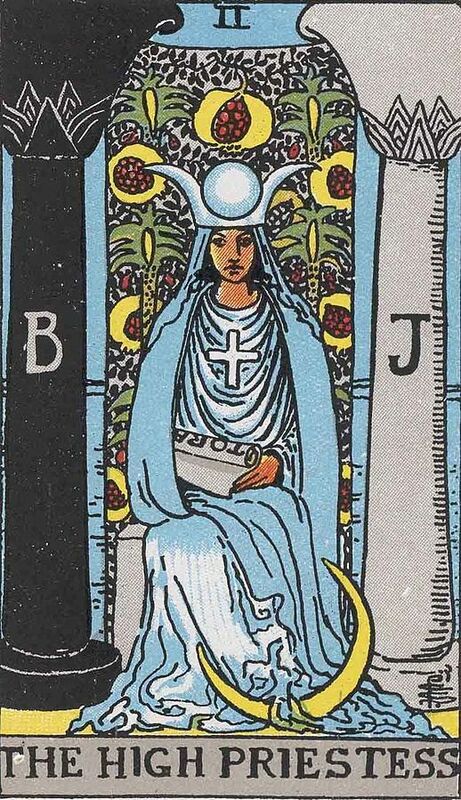 The next card in sequential order after The Magician is The High Priestess. In the wider scheme of the Qabalistic Tree of Life (the diagram of magic and mysticism representing the process of creation as well as the created universe itself) this card represents the feminine counterpart to the masculine representation found in The Magician. Though the Tree of Life is made up of ten stages, or spheres, of the Creator’s process of manifesting the world, there is also a dynamism of polarity exchanged between to the two sides of the Tree, representing Force and Form. The Magician represents the Forces being channelled for creation to flow, whereas The High Priestess represents the Form in which those channelled energies are housed. We see the figure of The High Priestess sitting between two pillars, portraying the two sides of the Tree of Life, the two halves of universal duality similarly depicted in the Baphomet imagery. These pillars also symbolise the two pillars in the entrance to King Solomon’s temple—Jachim and Boaz—a holy icon of Judaic mysticism (normally displayed as one being black, the other white, as adopted by the Masonic temples, as well). Behind her is a veil, covering the entrance to the temple, containing the Great Mystery behind for the initiate to uncover themselves, through her. Is it so surprising Lévi’s imagery is analogous to that of the Chavin? Similarly, and quite astonishingly, the temple entrance of Chavin de Huantar is framed by two pillars: one white, one black. Like The High Priestess, the initiate enters Chavin de Huantar in the darkness, their eyes veiled, housing the force (El Lanzón) contained within. Although the colouring of the pillars is not as prevalent today due to age and erosion, analysis and models show they were clearly painted in those distinct colours. Similar intimations of the duality embodied by these pillars is revealed in other imagery at Chavin de Huantar, including the ingeniously carved Raimondi Stele: another fearsome Lanzón-like deity holding two pillar-like stalks of the Huachuma cactus, another symbol of the balancing act between one force and another. 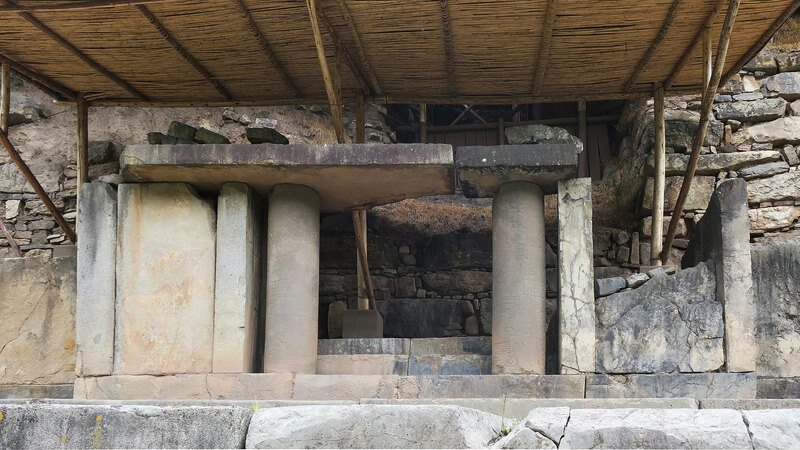 The temple entrance of Chavin de Huantar is framed by two pillars: one white, one black. Like The High Priestess, the initiate enters Chavin de Huantar in the darkness, their eyes veiled, housing the force (El Lanzón) contained within. Though the Tarot is a fairly recent phenomenon, its imagery is ancient and has evolved from spiritual traditions across the planet. This is just one of many more examples yet to be explored in the correlation of ideas and imagery found in ancient civilisations. The goal of my book, Shamanic Qabalah, was to take similar correspondences between the WMT and Peruvian shamanic practices and weave them together into a single system of spiritual initiation. By uncovering these similarities between cultures, we have the opportunity to adopt a global perspective of spiritual understanding. This universal paradigm, it is my hope, will assist humanity in our evolutionary call. Every culture holds value, regardless of the similarities that may exist. Yet, when we look closer, we are not so different from one another. Indeed, our ideas may be more congruous than we initially think. Shamanic Qabalah argues that indigenous shamanic practices started it all, and provide the foundation of the spiritual cosmology that has branched out into the various extant religious philosophies around the world. Many of these practices, like WMT and the Qabalah, have been refined into distinct symbolic systems which can unveil the mysteries of the temple, assisting us in our walk through the maze of consciousness, until we find our own inner Lanzón. Burger, Richard L. Chavin and the Origins of Andean Civilization, (New York: Thames and Hudson, 1992). Hancock, Graham. Magicians of the Gods, (New York: Thomas Dunne Books, St. Martin’s Griffin, 2015). Lévi, Éliphas. Transcendental Magic: Its Doctrine and Ritual, (Mansfield Centre, CT: Martino Publishing, 2011). Daniel Moler is a writer, artist, and educator from the American Midwest. He is the author of Shamanic Qabalah: A Mystical Path to Uniting the Tree of Life & the Great Work, as well as the psychedelic urban fantasy RED Mass, the Terence McKenna guidebook Machine Elves 101, and also a contributor in Ross Heaven’s book Cactus of Mystery: The Shamanic Powers of the Peruvian San Pedro Cactus. 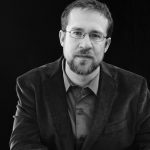 Daniel has published many other fiction and nonfiction works around the world in magazines, journals, gaming modules, and online. For Daniel’s blog, go to The Daedalus Thread.